Description: Listen closely. You can almost hear the soft whisper of pine branches as they dance in the wind with a low-hanging moon in the sky. 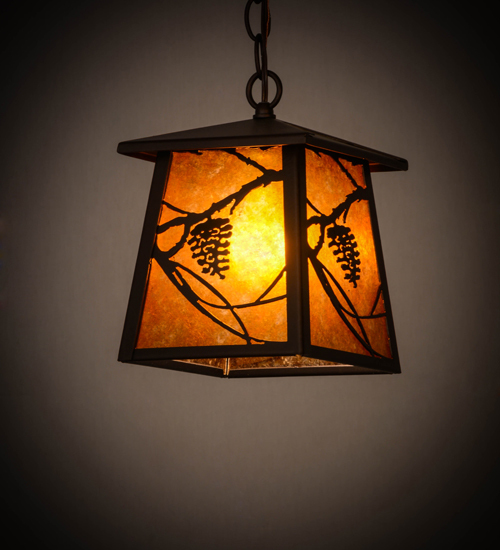 Enjoy the beautiful ambiance of the soft light diffused through a stunning Amber Mica shade, which features Pinecone and Pine branch motifs. The pendant is complemented with decorative accents, frame and hardware in a Mahogany Bronze finish. The fixture is handcrafted by highly skilled artisans in Yorkville, New York at the foothills of the breathtaking Adirondack Mountains. Custom colors, designs and sizes are available, as well as dimmable, energy efficient lighting options such as LED. This fixture is UL and cUL listed for damp and dry locations.